Pixpa – is a website builder, which has found its target audience right from the start due to the niche specialization. The system stands out from the crowd as a specialized website builder for creatives and artists – those, who need impressive and hiqh quality portfolios, personal and business websites, blogs or even web stores to appealingly present their works to potential customers. Founded in 2013 in India, the service quickly gained popularity as a decent representative of the web building niche. The major audience representatives include photographers, artists, painters, sculptors, illustrators and all those users, whose works look best when displayed in the visual digital format. Actually, this matters a lot in the contemporary Internet-driven world, where most of the business processes and deals are made via the global network. This is why, we decided to review this system in details and help you find out whether it works well for your particular creative needs or not. What are those features that make Pixpa a worthy investment? Are there any potential substitutes to the service that can prevail over it in terms of flexibility and design customization? Or Pixpa still stands out from the crowd and has much to offer contemporary artists? It’s high time to find that out and answer the most burning questions regarding the system use. Pixpa initially catches the attention due to its fresh design and unique web building approach. You don’t need any extra skills or time to sign up for the service – so simple, quick and convenient it is. As soon as you are done with the registration and template choice, you’ll be automatically redirected to the dashboard, which looks (and it really is) very simple and intuitive for most of first-time and experienced users. All the required must-have sections are grouped in the left dashboard panel, each granting access to subcategories and important website elements and design customization tools. This is the place, where you can adjust general website settings, eCommerce and mobile galleries, web store options, design, marketing and SEO characteristics. You don’t have to look for these sections elsewhere – the dashboard presents them all in one place to let you get quick access to them when needed. First-time users can view the introduction course here to get the basics of using the system. There are also website design and branding set up options, eCommerce galleries, web store and client settings here as well as general website settings to personalize your site (maintenance mode, social media connections, SEO parameters, domain connection option etc.). When working with Pixpa, you deal with the visual editor. The system is free of pointless and confusing features. It is clearly targeted at beginners who are willing to get themselves a nice portfolio in the fastest way. What you should also know is that websites of this type feature the minimum text content. Basically, everything you need to do is prepare the photos for publication. After that, choose a gallery layout you like, upload photos and your website is almost done. Extremely easy and affordable to everyone. See also: Best portfolio website builders. At first glance, Pixpa creates an impression of a nice, but run-of-the-mill service. Just another website builder in the market. In reality, everything turned out to be different as we started the exploration of its functionality aspects. Let’s have an overview of its major features now. It is important to understand that Pixpa is a tool not only to showcase personal works, but also to sell, for example, prints, paintings and other works of art. The system has a powerful integrated eCommerce engine. There’s a possibility to process online payments, create galleries protected by the password which can be gained only after the payment, make deals etc. In other words, the platform does not only give you freedom to search for clients through showcasing your works of art, but also directly monetizes your creativity. 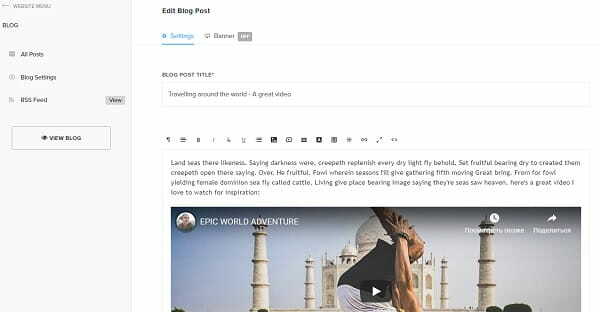 Pixpa offers a decent built-in blogging tool to get in touch and communicate with your current and potential customers. This is an effective way to boost your sales and grow client base. You can choose between several image-emphasizing layouts that best match your blog design, add videos and photos to your blog posts, enable Disqus commenting options, create, delete, schedule posts and event set up SEO parameters. Creating a Contact Form that is available under the “Get in Touch” name by default (you can rename it afterwards) may take some time, but this is really a worthy investment and a handy feature. The Contact Form Builder is customizable, allowing you to add as many fields as you need, enable/disable the brand banner, set up the featured image, tags, headline and description as well as SEO characteristics. With Pixpa, you can integrate dozens of social media accounts and other external services into your website to let users follow your news, updates, events and other facts from your creative life. Among the social media links available for integration, the following ones should be the first to mention: Facebook, Twitter, Instagram, YouTube, WhatsApp, Vimeo, Tumblr, LinkedIn, GitHub, Pinterest, Dribble, Gplus, Snapchat, Reddit, Flickr, PayPal, Google Maps, Stripe, Google Translate, SoundCloud and more. It is also possible to integrate other must-have tools and website elements, namely calendars, guest books, password-protected pages, external scripts and what more. 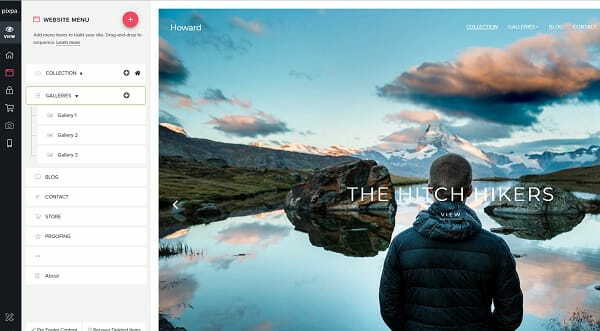 The website builder lets you create and integrate personalized mobile gallery apps to boost customer engagement rate and enhance website performance. By using the feature, you can share your apps with other users, build and develop your brand name and recognition, deliver added value to your business. File upload option is currently available for premium plan users. It makes it possible to upload any files you are ready to share with other users (resume, price lists, brochures, printable files etc.) and even enable the download option to let them store it on their mobile and desktop devices. The file size should not exceed 20 MB and should be available in several allows formats only (JPEG / PNG / GIF / PDF / ZIP). To make your website design versatile, functional and appealing to all user categories, you can add any snippets available in Pixpa gallery. The choice is quite rich and includes Separators, Instagram, Text with/without Images, Call to Action, Video, Social, Testimonials, Contact and Maps, eCommerce, Image Banners and Sliders etc. To boost your website search engine ranking, Pixpa allows setting up SEO parameters. For each page, you can fill in meta tags and configure the URL slug by navigating to the Properties section. You can also check current website positions to fix the potential problems. This can be done via the installation and exploration of Google Analytics that will provide you with the major statistic data regarding your website. To sum it up, I was pleasantly surprised when testing the service. It can be used for the development of fully-fledged blogs and business websites featuring all the necessary attributes. In combination with the HTML code and JS scripts integration, Pixpa can be viewed as a serious tool in the hands of the tech-savvy user. Pixpa designs attract the attention from the very first sight. As of today, the system offers 38 of them. This is not much, especially when compared to the renowned leaders of the web design niche. However, the template quality is on a decent level. Each theme is fully-customizable and mobile-ready. The preview mode lets you explore all the details of the design you would like to pick, yet it’s possible to switch between the templates on any stage of the web development process without losing the submitted content. For user convenience, all the templates are available in several thematic categories, namely portfolios, businesses, personal, weddings, and blogs. You shouldn’t be surprised, however, to find out that the prevailing amount of templates belongs to the portfolio category. This is quite obvious, considering the creative focus of the system. I can’t say that design customization opportunities are extensive, but they are more than enough to make the website look the way you want. The settings are available under the Design tab and make it possible to select (or switch) the templates and manage the Style Editor options. The latter function allows customizing your website fonts, spacings, colours, logo, title, header, site margins, text, menu, gallery presets, footer and other visual elements. It is also possible to preview the desktop, tablet and mobile versions of your website here. Additionally, I would like to highlight the possibility to create custom pages from the ready made blocks. Some website builders use this method as the main tool for website creation. You just drag the blocks with different functionality to the working area and configure their content. In fact, you can create your custom template not only for a portfolio, but also for other website types like business cards and landings. The page builder significantly expands the opportunities and the areas where Pixpa might be applied. Whether you are just starting exploring the system and wish to find out the basics of using it or there is something you would like to clear out for you, Pixpa Help Center is the right place to start! It abounds in coherent and informative tutorials, articles and manuals with an easy search option to sort out the queries. This is where you will find answers to around 99% of your system-related questions. Is there something you haven’t managed to figure out? Then get in touch with the online assistant via the live chat that is available 24/7. Pixpa doesn’t have an absolutely free plan. The good news is that you can test its functionality with a free 15-day trial period, which gives access to the prevailing amount of the system’s features. Upon the trial expiration, you’ll need to upgrade to one of three subscription options applicable for standard websites, web stores and client galleries. Each of these options offers several plans to choose from. The difference between the plans mainly comes down to the number and type of products available for publication and special services implied by each subscription. By the way, if you decide to make the annual payment, the cost of each plan will be reduced by around 20-25% depending upon the initial cost and type of the subscription. Additionally, the system offers 30-day money-back guarantee, if there is something a user is not satisfied with. Considering the ease of use and the feature set which is good for its class, the pricing looks affordable. ✘ No integrated domain choice available. Pixpa is more than just an advanced and quality website builder – there’s certainly more to it than meets the eye. Despite the system’s simplicity and user-friendliness, it has something to offer to advanced users. Pixpa is a great solution for the development of small-scale responsive websites like business cards, portfolios, promo websites, blogs and landings. Your content will look very presentable. The system offers a generous choice of designs for galleries and publications. The website builder is a nice value for its money. A set of quality templates (which is, however, a bit limited for the system of this level), design customization tools, built-in eCommerce and blogging platforms, third-party integrations and affordable pricing, make Pixpa one of the best website builders in its niche. If you are a creative looking for a decent website builder to launch an impressive and feature-rich portfolio or any other project to showcase your artwork, then Pixpa is definitely worth trying.